It is often stated that trying to deal with information on the internet is like drinking from a firehose. But trying to put together a book about the current state of digital anything must be rather more like trying to paint a landscape from the window of a moving train. By the time the painting is complete, the scenery has changed dramatically. This puts books on digital approaches to academic disciplines in an interesting position: by the time a volume makes it into the hands of its readers, it is already a historical document as well as a scholarly work. The editors of Digital Research in the Study of Classical Antiquity are very aware of this: as they state, the book seeks "to create a snapshot of the research activities of Digital Classicist members as represented by a selection of the papers given at our Summer seminars and conference panels in one particular year, 2007" (p10). When one considers that the printed volume went to press in 2010, and is being reviewed in 2011, this means that almost four years—a digital eternity—have passed since most of the papers were first composed. I think, therefore, it will be most useful to discuss Digital Research from two perspectives: first, in terms of its scholarly contribution, and second, in terms of what the framing of this work and the identity of its contributors tell us about a particular moment in the history of the field of 'digital humanities'. The Introduction presents the book very clearly as the reflection in print of an emerging "network, a community of users" founded in 2004 as 'The Digital Classicist' (p2). This user community consists of a diverse group of Classicists engaged in research and publication involving interdisciplinary approaches and digital tools. The chapters in the book are thus representative both of the community itself (Bodard and Mahony, the editors, are two of the community's four administrators, and all the first authors but one are also members) and of the sort of research it is meant to foster. Bodard and Mahony have assembled a group of contributions that they arrange into three categories: 'Archaeology and Geography', 'Text and Language', and 'Infrastructure and Disciplinary Issues'. Only the contributions to the 'Text and Language' section are thematically homogeneous. The other two sections are somewhat more eclectic, although here, perhaps to provide greater coherence, the editors specifically commissioned papers from contributors who were absent from both the 2007 Digital Classicist seminar series and panels at the 2007 Classical Association Annual Conference, from which all the other contributions were drawn. This eclecticism offers both advantages and disadvantages: the chapters cover a very broad range of issues, but as a result the book as a whole does not speak to a well-defined audience. In particular, there is a tension between assumptions about the degree of digital literacy of the reader, and the implicit desire of the editors and contributors to attract and inform less digitally savvy Classicists. Essentially, it is not clear if the work is meant for those who are already numbered among the recruits to digital approaches or those who might be interested in signing on. The contributions also vary in scope, from the presentation of the results of individual projects to the exploration of discipline-wide theoretical and methodological issues. The first section, 'Archaeology and Geography', consists of three chapters. The first is a summary by Fulford, O'Riordan, Clarke and Rains of the development of the digital recording system at Silchester, a Roman site that since 1997 has been a test-bed for the use of digital tools in archaeological excavation. The temporal breadth of that project, carried out by the University of Reading, is reflected in the content of the chapter. It begins with a justification of the development of a digital database for stratigraphic recording, which might have been necessary in the late 1990s but is less so in 2010, when databases are the norm rather than the exception (as the authors themselves recognise, p20). The discussion of the diachronic development of the database itself is much more useful, however, since it highlights not only solutions to recording issues common to most archaeological projects, but the ongoing process by which the project arrived at those (sometimes short-lived) solutions. The Silchester team has been more self-conscious than most about its adoption of new technologies, and its field seasons in the 2000s have consistently involved a systematic user-testing component. This chapter provides a valuable discussion of that approach: even though a number of the tools discussed were outmoded by the time of publication, the field archaeologist can benefit from the enumeration of practical difficulties associated with the generation and integration of digital documentation in the course of excavation. Interestingly, despite buzz about new tablet computers, the database section of this chapter focuses on the conversion of written information to a digital format—the device most recently tested when the chapter was composed was the digital pen and notebook. It will be interesting to see whether hand-writing survives the next decade as a standard form of archaeological documentation. Sebastian Heath's contribution, the next in this section, takes an entirely different tack. Rather than focusing on the results of a project, he provides a more general discussion of a few key issues in the dissemination of archaeological information over the internet. Central to this discussion is the tension between access to data and the quality of that data. Using a series of case studies, Heath argues that scholarly traditions of limiting access to data are pushing data consumers, especially in the general public, toward more open but often more problematic sources of information. Reputable collections of information such as JSTOR, museum websites, and even ADS make it difficult to find and reuse data through the restriction of access (JSTOR is behind a paywall), through the limited visibility of their holdings to search engines, or through the lack of "permanent and short URLs" (p51) for the items they contain. Dealers in and collectors of ancient coins, on the other hand, offer large collections of easily discoverable images of numismatic material. The chapter is thus a call for the repositories of scholarly information to make their contents easier to discover and easier to reuse. The following chapter on 'Neogeography' moves off in yet another direction. In it, Stuart Dunn sets out to discuss the impact of new, widely available spatial tools—and in particular the capacity of these tools to produce user-generated content—on archaeological knowledge. This chapter is somewhat less successful than the first two, in part because it compresses a complex theoretical background uncomfortably into the first few paragraphs, and in part because it does not quite reach its goal of "a high-level synthesis of the utility of [neogeographical] methods in understanding past constructions of space ... as opposed to representing and describing them" (p57). It was not clear to me how the intervisibility of sites in Google Earth, the accumulation of user-generated content around points of archaeological interest, or agent-based modelling of Byzantine military campaigns tell us about anything other than the ways in which we understand space. The clarity of the argument is not helped by the illustration of issues of topography with screen-captures from Google Earth in which topographic views of the landscape are not used. On the other hand, Dunn's contribution makes the important general point that vast sets of crowd-sourced or collaborative 'neogeographical' data have the potential to open new avenues for archaeological research. I found a similar unevenness in the contributions to the following section on 'Text and Language', although in this case the common threads in these three chapters were much clearer. I wonder if, again, this may be due to ambivalence about the book's intended audience. This was most apparent in the first contribution, by Charlotte Tupman, on the digital publication of epigraphy. This area is, I think, very exciting to those on both sides of the digital/classicist fence, but in attempting to cater to both sides at once, Tupman does not quite serve either. The first part of the chapter is a long review of epigraphic publishing practices which will be overly familiar ground to most Classicists; the second is a long review of XML and digital publication which will be equally familiar to most digital humanists. The conclusion—that digital publication makes it easier to study epigraphic monuments in context and in detail—is certainly true, but does anyone still need to be convinced of this? Tupman does touch on one key technical issue, however, which I think reveals better than anything else the necessity (not just the advantage) of markup-based electronic publication of epigraphic material. She notes that XML encoding makes the complex system of editorial comment in traditional epigraphic publications transparent: that is, it is always clear what parts of the text are lost, what parts are restored, and what restorations the editor is uncertain about (p82–83). In this way, the rich editorial history of the object can be preserved intact, without ambiguity. I think this is a more important point than the idea that digital publication allows the inclusion of more photos, and wish it had been given more emphasis. Skipping ahead, a similar point is made more effectively in Notis Toufexis' chapter on the diachronic study of Greek. Toufexis argues very convincingly that text mark-up allows us to move beyond the idea of a single critical edition of an ancient Greek text and instead to preserve the entire rich history of 'misspellings' and 'misreadings' in the manuscript tradition that the editors of ancient texts go to so much effort to marginalise. Here the review of the tradition of scholarship is well placed, for it highlights the specific textual and linguistic issues that might be tackled with a very large corpus of marked-up manuscript variants and clear digital conventions for editorial interventions. What Toufexis does not provide is a roadmap for the way in which the editor of a Classical text might approach the production of such a digital edition. Nor does he comment on the additional skills or effort a rich digital edition might demand of its editor, although he offers the reader several prototypes as examples (p116, footnote 49: an online edition of Galen's commentary on Hippokrates and the 'New Testament Transcripts Prototype' give the reader a particularly good idea of the approach he envisions). One suspects, in fact, that such an edition would require far more than a single pair of hands. This is confirmed by the following chapter on the Homer Multitext Project, which describes the development of software for, and the practical execution of, a very similar approach. The chapter that lies between the contributions of Tupman and Toufexis is a more traditional report on the development of a platform, in this case 'A Virtual Research Environment for the Study of Documents and Manuscripts'. The authors, Bowman, Crowther, Kirkham and Pybus, argue for the value of a digital interface in which scholars can collaborate on the study of texts from remote locations, while enjoying access to a full range of supporting material and tools (especially with relation to digital images). They go on to describe the construction of such an interface, and present a case study of its use in the rereading of a stylus tablet from the Netherlands. To this point the chapter presents an argument for the usefulness of resource-rich collaborative systems that is both convincing and accessible to a 'lay' Classicist reader. The subsequent technical section, on the other hand, would not be at all accessible to a reader who does not know, for example, what a "JSR-168 portlet" is (p96), although it would presumably be useful for an information architect. In their conclusion, the authors outline plans for the integration of this virtual research environment with that of the Silchester project. But it is difficult to understand how all this will be useful to the reader who recognises the value of such a collaborative tool: should one expect to have access to this VRE as a scholarly resource, or is the chapter rather a blueprint for the construction of one's own? The online presence of this VRE and of Silchester's does not answer the question—neither is currently available to external users. The four chapters in the final section on infrastructure, though an even more diverse group, offer the reader more tangible benefits. This section begins with Neel Smith's chapter on the Homer Multitext Project, which one might have expected to find in the preceding section on text, but which has been included here presumably because of the chapter's heavy emphasis on the project's underlying architecture. This chapter provides a much clearer picture of what is involved in the generation of the sort of rich, multilayered textual-history interface endorsed in the preceding chapter, on the level of both conceptual models and software. The project itself is live and accessible. And, admirably, Smith discusses not only the project's present capabilities, but the long-term preservation of the underlying documents and their relation to each other. The treatment of these issues is perhaps a little too technical, again, for the digitally uninitiated. It would be a shame, however, if this were to prevent such readers from considering it closely, because questions of the interrelations between the many parts of a textual tradition are central to the study of Classics, and Smith and his colleagues have taken a very thoughtful approach to the organisation of those interrelations in digital form. Of particular use to those who regularly use the TLG and other electronic editions is the discussion of a Uniform Resource Name system that permits both the unambiguous citation of a digital text and the clear encoding of relationships within manuscript traditions (p130). The preoccupation with longevity is taken up on a conceptual level by the next chapter, which echoes the call for openness made by Heath earlier in the volume. In this contribution, 'Ktêma es aiei: Digital Permanence from an Ancient Perspective', Hugh Cayless examines the common features of the transmission of ancient texts to conclude that opportunities for copying and reuse offer the best chance for digital objects to survive into the future. Not only should digital material be made available for reuse by as wide an audience as possible, but the material should be in formats flexible enough to accommodate user-generated additions and annotations—the scholia and marginalia of the digital age. Digital publication strategies that replicate static print media—PDFs and the like—are therefore less desirable than strategies that leave documents open to the accretion of additional semantic information (p148–49). If Cayless provides much food for thought but few specific tools, the following chapter does rather the opposite, at least for a reader who is involved in teaching. OKell, Ljubojevic and MacMahon present a customisable, multimedia pedagogical software package for the creation of 'Generative Learning Objects', or GLOs. GLOs are interactive digital modules that allow evidence to be evaluated from several different angles, emphasise the process of interpretation, and provide feedback on student input, thus encouraging the development of critical thinking skills. Though the discussion of the pedagogical framework is important for those who do not spend time in a classroom, several of the concepts involved will be familiar to the rest of us. What is new, however, is the toolkit itself, which seems potentially very useful for the development of the sorts of exercises that many of us still build on paper or through basic websites. In particular, the package is designed to encourage 'the spirit of enquiry' (p162) among its student users, rather than the search for a 'correct' answer to a specific question. Since the software package is available for download, along with the example discussed in the chapter and even evaluation modules, this chapter can serve in practical terms as the stepping-off point for the implementation of the pedagogical tool it describes. The collection concludes with a thoughtful contribution from Melissa Terras on what it means to be a 'Digital Classicist'. Terras's essay considers the practical implications of the editors' endorsement of collaboration and interdisciplinarity, and thus serves as a bookend to the introductory chapter. Here the question of audience emerges again. Terras's points will be all too familiar to anyone who has worked with Digital Classics in the last decade, although she presents the issues in an especially clear and compelling manner. The reader who will benefit most from this chapter is the Classicist who is interested in digital approaches but not yet heavily involved. Terras points out that Digital Classics builds on habits of interdisciplinarity deeply rooted in the field, and that Classics was an early adopter of digital technologies, which were rightly seen as useful tools in the management of a complex textual tradition (p172). At the same time, humanities disciplines in general tend to be lukewarm, if not hostile, to the idea of collaborative work—at least to the extent that such work does not produce single-author monographs. Terras's blueprint for the navigation of these pitfalls focuses on the development and management of project teams (the team approach is perhaps more widely accepted in the UK: even collaborative digital projects in the US tend to be conceptualised as the brainchildren of one or two Primary Investigators, who receive the bulk of the public and academic credit). She ends with a call for evangelism on the part of Digital Classicists, whose promotion of the value of Digital Classics will eventually lead to its recognition as "an academic discipline" in its own right (p188). In the final paragraphs of this chapter, the target audience shifts once more: Terras's conclusions seem to be directed more at confirmed Digital Classicists than at potential converts. I use the language of religious conversion deliberately here. I think a useful analogy can be drawn between this moment in the emergence of Digital Classics as a field, and the early stages of the establishment of a religion, during which a small number of devoted practitioners attempt to convince the wider community of the value of their new view of the world, even in the face of negative personal consequences. As Terras recognises, it is still the case that '[i]ndividuals can also face issues with the acceptance of their interdisciplinary research (and multimedia) publications by their Classical peers' (p184). Since I feel this book encapsulates the spirit of this particular moment, when intriguing ideas that have been around for some time are beginning to catch on more broadly, but are still meeting with resistance from sectors of the academic community, I would like to make some brief comments from the perspective of an American Digital Classicist about the volume as a historical document. The most obvious themes that span the various contributions to Digital Research are very much connected to the state of digital discourse since around the middle of the first decade of the 21st century. Most of the contributors are concerned with collaborative work, and with the structures that facilitate that work; an interest in multivocality is equally present in most of the chapters. Concerns with the openness of information, its discoverability and interoperability, are also in the foreground throughout the book. All of these themes reflect developments in the larger computing community during the same period, especially in relation to the internet: one might point to the open-source movement, the rise of the 'semantic Web' and of crowd-sourced content, and the growing attention to 'big data' in both commercial and research circles. There is also a growing (and welcome) concern, visible in some of these contributions, for the long-term preservation not only of the new data objects being generated, but also of the relationships between those objects. The study of Classical Antiquity relies on contextual relationships, and it is heartening that as we place our faith more and more in digital means for the expression of such information, scholars are beginning to think about how it might survive changes in software, platform, or approaches to computing. This, too, reflects an emergent concern in the broader field of data management that has received more attention since the middle of the first decade of the 21st century. History and geography are of course closely connected, and this book clearly represents a historical moment in a particular place. There are few contributors from outside the UK, and none from outside the Anglophone world. As a result, broad areas of importance to Digital Classics go unrepresented: the most glaring omissions involve imaging techniques and three-dimensional reconstructions, both of substantial importance to scholars working in Digital Classics in other European countries. Spatial technologies are represented only by Dunn's contribution, although a much broader range of spatial tools have come to play a fundamental role in Digital Classics in the last few years. Here I think the omission is a function of time rather than space: the 'spatial turn' has been encouraged since 2007 by the advent of machine-learning approaches that allow researchers to extract and visualise various sorts of information automatically from digital text corpora. Machine learning and natural language processing are not mentioned at all in the book. Time may also be responsible for the lack of reference to some light-weight digital-photography visualisation techniques that seem relevant to the discussions of inscribed objects in the second section. Polynomial Texture Mapping, for example, has been applied successfully to objects like the Antikythera Mechanism; and its potential for the study of inscriptions or stylus tablets seems obvious (full disclosure: I organised a pilot project to apply this technique to an epigraphic corpus at the site of Chersonesos). Again, this is a technique that began to be widely adopted only toward the end of the first decade of the 21st century. This highlights the extent to which books about digital approaches are dated almost as soon as they come out. At the same time, it is interesting to note the lag between the development of digital projects and their launch: several of the digital projects that seemed to be close to public release when the authors were making their last revisions (2009, to judge from reference dates) have not materialised as of May 2011 (XDB-Arch, a cross-database search platform mentioned in Bowman et al., appears not yet to be functional, and the site for the Reference Grammar of Medieval and Early Modern Greek, noted by Toufexis as scheduled for a 2011 release, has no information about a launch date). The delay drives home the way in which digital humanities projects are often caught between their long gestational periods and the rapid changes in the technologies involved. A glance at the professional profiles of the contributors to the work also provides information about the state of the field at this particular moment. Only four of the twenty contributors (Bowman, Fulford, OKell, Smith) hold traditional academic positions in departments of Ancient History, Archaeology, or Classics. Another (Terras) has a traditional academic position in a school of library, archive, and information studies. Nine more have traditional academic training in Classics or Classical Archaeology, but now hold non-traditional positions in specialised humanities computing centres (Bodard, Dunn, Tupman, Mahony), in centres or institutes dealing with aspects of the ancient world (Cayless, Crowther, Heath, Toufexis), or in the UK Higher Education Academy (MacMahon). The remaining six (Clarke, Kirkham, Ljubojevic, O'Riordan, Pybus, Rains) are professional archaeologists, project managers, or IT professionals. This is interesting not only because it shows this particular community practising the sort of interdisciplinarity it preaches, but because it suggests that junior scholars who put much of their energy into Digital Classics do not end up in traditional academic positions (the three professors among the contributors are all at a senior level). Finally, the physical book itself. This is perhaps the most telling indicator of the historical moment of its production. Despite its call for openness and reuse, despite its appeals to traditional Classicists to recognise digital scholarship, and despite the obvious advantages of digital venues for speedy publication, the book itself is available only in printed form. It has a page in the Stoa Consortium Archives, on which, in response to a comment from a visitor, Bodard explains that the book's only digital version will consist of individual chapters put up at the discretion of the contributors. To date, in addition to the introduction, only three contributors (Heath, Terras and Toufexis) have put up their chapters. All of them are in PDF format. Clearly, print publication is still the gold standard of scholarly production, and whether this was due to professional demands or the requirements of a publishing contract, even the most committed Digital Classicists have decided here to present their work in that traditional medium. In many ways, it is not the ideal form for this material, which is perhaps more useful framed as individual contributions aimed at different audiences. The illustrations would certainly have been greatly improved by colour and multimedia, and digital publication would have made it much easier to investigate the many links cited. I highly recommend the book to anyone who is interested in the field of Digital Classics and digital humanities in general, but I do wonder who will purchase a physical copy, and to what extent that physical copy will still be consulted in ten or twenty years. But this is a question one might ask of all scholarly books, and in many ways, I expect this book to be more useful in the future than others on more 'academic' topics. Most of the contributions ask questions or discuss approaches that are not tied to specific digital platforms, but lie at the core of Classics and Classical Archaeology. 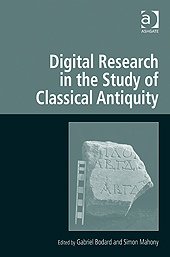 Between its coverage of these bigger-picture issues and its value as historical testimony to a particular moment in the evolution of Digital Classics, Digital Research in the Study of Classical Antiquity comes as close to being a ktêma es aiei—a 'possession for all time'—as one can hope for in a book on the rapidly changing field of digital scholarship.